Just as autumn must inevitably lead to winter, so must I inevitably get onto Nazi Germany eventually. 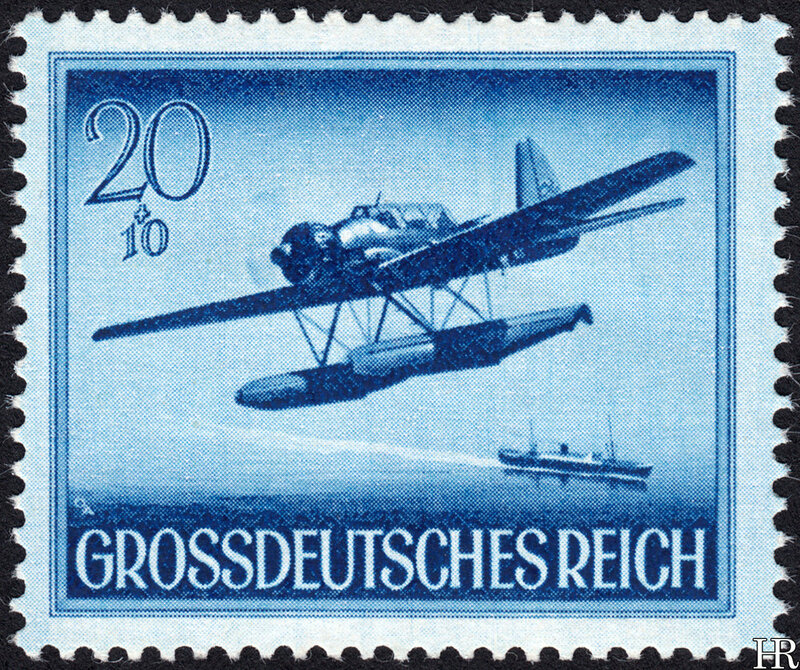 The Third Reich's philatelic output, taken as a whole, has a curiously bland quality: even throughout the war years the majority of stamp designs were focused on peaceful, inoffensive themes, with little of the aggressive propaganda one associates with the Nazis. Of course the Nazi aesthetic in general was far kitschier than posterity remembers: the uniforms, the military technology and the sinister architecture have remained in the collective consciousness long after the dreadful art has disappeared. 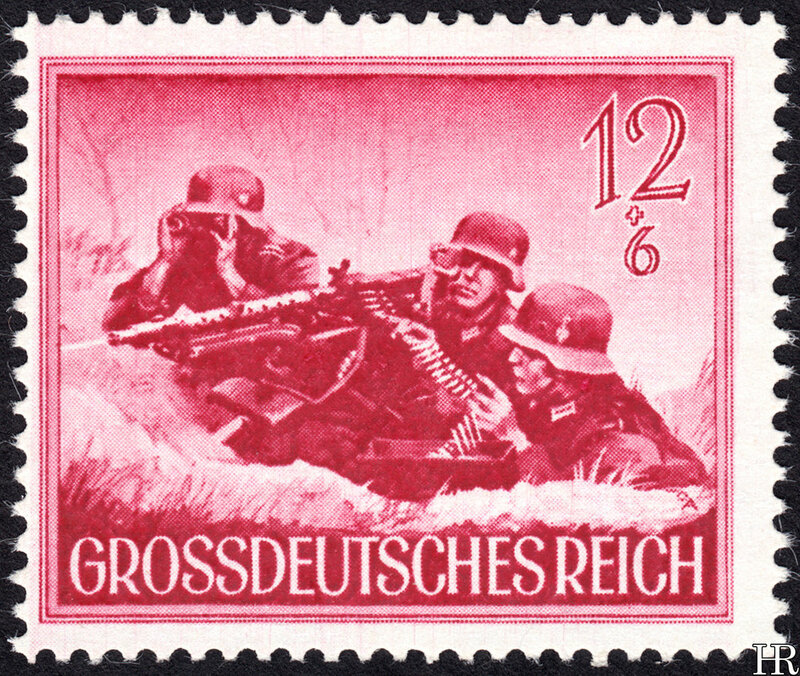 The first really militaristic issue came only in 1943: like the above stamps, a set in commemoration of Heroes' Memorial Day (a public holiday for the commemoration of German war dead, held in March). That issue likewise depicted various combat scenes, to not much aesthetic effect: the decision to use engraved designs I think gives the stamps a kind of mannered, unnatural quality. Anyway in 1944 a far superior attempt at the same theme was made, this time with quasi-realistic photogravure designs, which are a much better fit for the material. This proved to be the last large-size set issued by the Nazis, and evidently large amounts of it were still sitting around in 1945 for the dealer trade to vacuum up: today the entire set can be obtained for close to nothing. 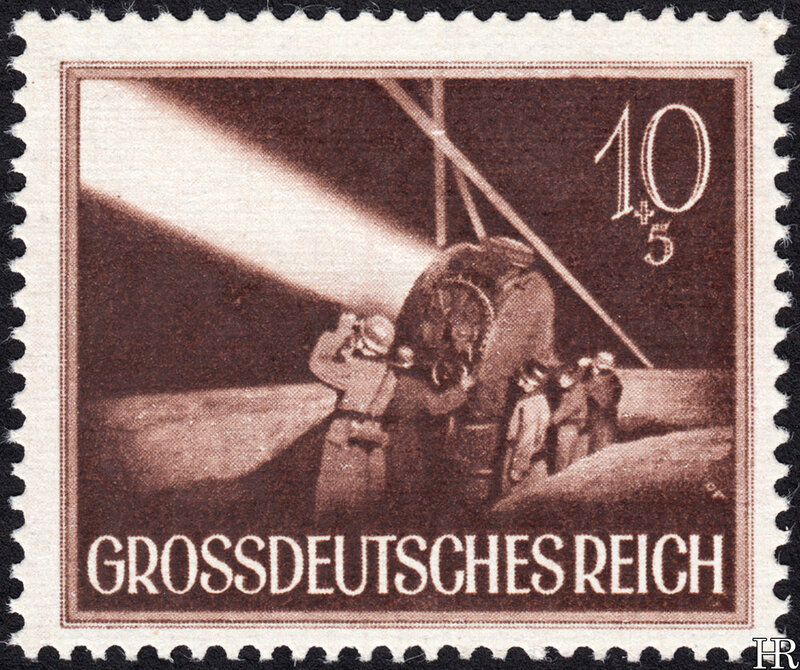 The stamps do seem to have received genuine use, however — probably helped by the low face values. 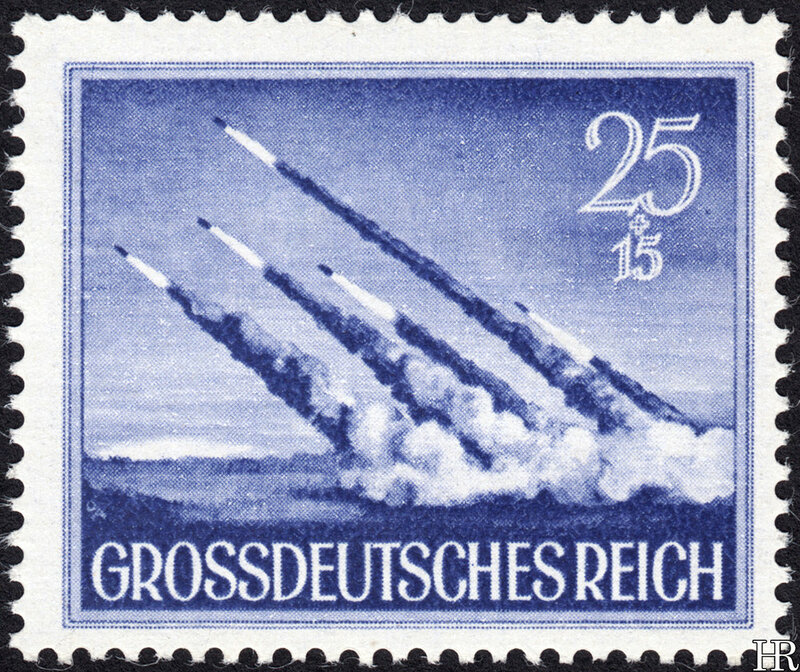 Like all German stamps of this era these are semi-postal, with a surcharge for some cause or other. Anyway these are some excellent designs, and certainly the best Germany produced in what we might regard as the Nazi idiom. 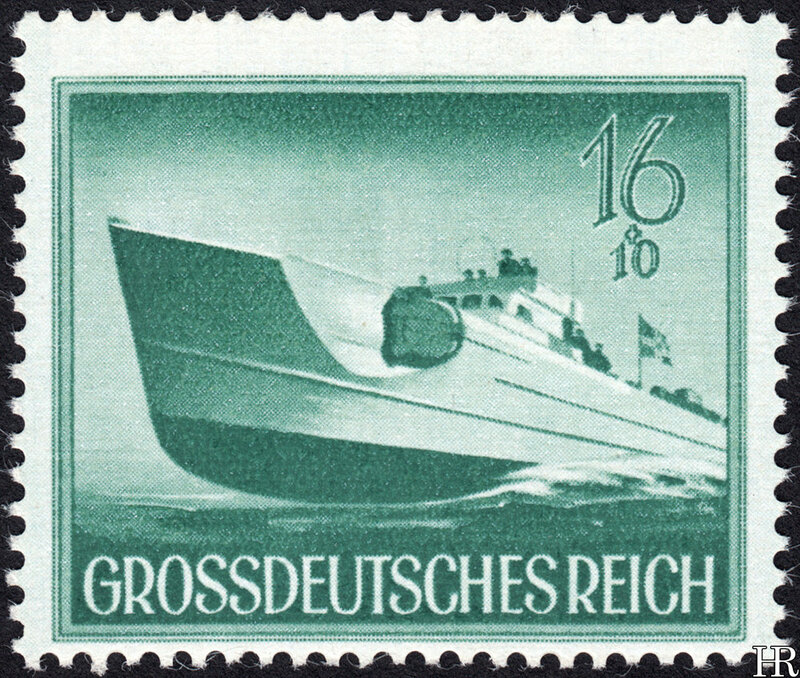 Designer was a Mr Ottomar Anton, who also produced some of the well-known SS propaganda posters. Print quality isn't great, as can be seen: lots of stray ink and parts of screens all over the place. The designs gain nothing blown up to large size, but that's true for all photogravure designs, and the colours are nicely vivid in a way that doesn't translate to the scans perfectly. The 20 pfennige design is intriguing: it's much less overtly militaristic than the others, and it's on the international letter rate stamp.  Did somebody at some point decide there'd be value in putting a somewhat more pacific image on the stamp most commonly going to foreign countries? Quite an idealistic approach to take that late in the war, if so.